In this instructable / video I will show you how I made portable indoor light with 100W LED chip which is powered with 19V 90W power supply from an old laptop. Some preview shots of this project. I started with drilling holes and making threads for the screws that will hold 100W LED chip. As this process isn't that hard I won't go into details. For the LED I used CPU cooler which is capable of 100W heat dissipation. I added thermal paste, spread it across all surface of the LED and tightened with M3 bolts. I cut all parts for this project from 12mm thickness plywood. Front part which will be in front of the LED, took most time to make. I routed two gaps for the wires from the LED and glued the parts which will make the front of the light. On the back piece, I made two wide holes for the air to go in for the LED cooling. I glued side parts to the back part. But I forgot to cut the corners first. I suggest just connect those parts with two screws in each side without gluing. This way you can dissemble the parts when you need. Then I made pilot holes for the booster and step-down module. I cut top corners of the pieces that will hold main frame of the light. I also cut two small blocks and made pilot holes in them. I made pilot holes in the sides, attached small blocks to the heatsink and extended pilot holes into the small blocks. Before connecting anything, adjust output voltages of the step-down module (to 6-7V, for the fan) and the booster (to 31V, for the LED) if you are using 19V and 90W power brick from an old laptop. But if you will use more powerful power supply you must use booster module with constant current adjustment (like this https://amzn.to/2D7LCR8 ). I used the booster without constant current adjustment, because with a 19V 90W power supply even in "ideally perfectlyworld" running LED at 31V I would get max current of 2.9A and the LED that I used is rated for 3A. More realistic, with power losses, when converting 19 to 31V you should get like 2.5A MAX. So to be clear, for these LEDs, you should always use booster with constant current adjustment. Even if 90W is max power for these 19V power bricks, you shouldn't run them on max power. For long term use you should aim somewhere from 80-85W, as running on max power, overheats power brick quite fast. Meanwhile running on lower wattage, power brick just gets warm. Also by not fully utilizing power capabilities of the LED you run it way cooler, fan produces less noise and you extending LED life time by a lot. I drill hole into the back piece for the power cable, and made more holes for the holder which will hold main frame of the LED. By doing this way, you hide the nut, which holds the bolt and on the outside you can tighten the frame at any angle with clamping nut. I made more pilot holes into the frame holder and into the pieces at the top and the bottom. Next, I glued front piece to the back piece. While glue was drying, I made slot by drilling not the all the way through for the tripod mounting parts or just for any wire to hang the light. I sanded with all parts assembled and painted with all parts disassembled with white color paint. I left only two power wires and cut others from the fan. I soldered two wires to the LED and added solder on the step-down module's contacts while it is easily accessible. I tightened the booster, step-down module and small blocks to the cooler. For more protection I added electrical tape behind the LED contacts. I tightened the bolts, soldered two more wires (these will go to the step-down module) and screwed wires from the LED into the booster where OUT is written. I screwed 19V power brick wires to the booster where IN is written and hotglued the cable. Finally, I soldered those previously attached wires to the LED wires to the step-down module's IN connections. And wires from the fan to OUT connections on the step-down module. Thin wire can be secured with some hot glue. I assembled all parts and the light is DONE! To be honest I really like the look of the light. The light frame is very sturdy! At 31V this light consumes around 85W. The LED doesn't heat too much and heatsink after 30min gets barely warm at 20C room temp. Don't buy cheap no name power bricks. Better buy used from well know names like Samsung, HP, Dell, Lenovo and so on. Cheap power bricks with high amps usually are scam. Those are very light compared to OEM ones. Avoid these cheap connectors which are rated at 3A MAX for this build. Connect power brick wires directly to the booster or use connectors like XT30 which can handle 30A MAX. 12V power brick can be used, but it's inefficient don't bother using it. Comparison with my previously made 90+ CRI photography LED panel. LED that I used in this project (Chanzon 100W 4000k) is good enough for the basic portable high lumen lighting, like in garage and etc. But then I suggest using 19V 120W or 135W power brick and booster with constant current adjustment ( https://amzn.to/2D7LCR8 ) to prevent burning the LED with higher current than it is rated for. I hope this instructable / video was useful and informative. If you liked it, you can support me by liking this Instructable / YouTube video and subscribing for more future content. Feel free to leave any questions about this build. Electronic components have a wide range of failure modes. These can be classified in various on a chip may thus cause secondary overvoltage damage. Thermal runaway can cause sudden failures including melting, fire or explosions. High Heat or flame and Wood are very combustible, Combustible materials will ignite, burn, or release flammable vapors. Wood is by far the most common combustible material. Maybe you can use, Latex Interior Intumescent Fireproofing Flame Retardant Coating for Wood or Fire Safe Clear Interior Fireproofing Flame Retardant Intumescent Coating, MDF FR, Fire Retardant plywood next time? Not wrong there mate. I've been around timber most of my life. It's the first thing to get lit tf up. As soon as I saw him cutting timber to create the frame I knew this would be very dangerous, and to the clowns saying "mIgHt As WeLl SpRaY yOuR lAmPs WiTh FiRe ReSiStAnT" well if anyone did their research most lamps that have "timber" as it's base is usually special bonded woods that get heat treated and even if it's not treated which I wouldn't buy one with normal untreated timber they have fail safes in place like plastic holders, or a fire retardant metal holders. And if op claims just because "it's LED" doesn't mean it doesn't heat up, I have a 10w LED and it burns so much it actually melted my plastic casing due to leaving it on for so long with cheap modules controlling the LED. They get hot. This instructible is great with some good ideas but the execution is poor specially using untreated timber around electronics that use either mains power or a decent voltage battery system. Lamp shades are made of paper and incandescent lights have far greater heat output. You aren't being logically consistent if you think this is dangerous but lampshades aren't. Your plastic example has no relevance either. The flashpoint of wood is over 500 degrees F, while the most commonly used plastics melt between 200-300F. You are fear mongering and nothing more. Telling people not to do this even with "cooling tech" just shows how little you are actually thinking about this. If you are removing the heat, it has absolutely no danger of setting something on fire. I appreciate your point of view. If anyone are that concerned about this light going on fire, paint it with fire proof paint or apply extra fireproof coating. I tried to burn a thin paper towel in front of the working LED, but I failed to even get some smoke. This is LED after all and not incandescent light. They don't produce that much heat. But for 200W+ LED I would avoid using wood for the front frame of the light. One thing that I think could start a fire on this LED would be long short circuit. But that is almost impossible with OEM power brick and fuse protection at home. Not only are you wrong, you are also rude about it. This is not a fire concern at all. If you are worried about this, you should go around and paint all your lampshades with fireproof paint. What did I say that was rude? and what am I Wrong about? Personally I don't think J ED was rude or wrong. High power homebrew electronics right near wood in an application that would presumably be often unattended. What could go wrong?! I hope you guys have working smoke detectors JIC. I read all electronics Instructables with trepidation. As a thirty five year veteran designing consumer electronics, I’m always concerned with the safety of projects that are obviously designed by someone who doesn’t know the basics and/or details of what they’ve instructed. Then, it might be copied by a subscriber with even less understanding. Ironically, in all the worst instances of this, we invariably see the author come back fighting if any electrical engineer makes (valid) comments about the post. My hope us that Authors will realize that the Instructables community has a lot of experts on just about every topic. Authors aren’t expected to be experts at every turn (It’d be great if every electronics Instructable didn’t make me cringe...). Should be ready to accept suggestions from others who might be expert at what the speak. Coming out fighting that you can “touch” it for two seconds - well it’s just silly. I appreciate your feedback. I am not fighting, I just have different opinion and I am trying to argue to understand why it is for someone a big safety concern. But no one yet pointed exactly what in this build is so safety concerning. I just want that someone point out exact thing (like tantalum capacitor) with detailed argument why at what temperature and so on. I would love that! Please who has huge experience explain with a lot of details to us hobbyist DIY creators. Don't only say that you are doing wrong, that's bad: wood + electronics = fire. I want exact details, this way I can learn. You guys who have a lot of experience most of the time write very abstract comments, like copy paste from Wikipedia.. (from my experience) And you wonder why people argue with that? As for "touch" thing, it's very simple explanation, but I guess you not fully read that you are leaving comment like this. So I just summarize it for you: most of the heat from the LED comes from that yellow area, that is light's emitted heat (EM waves). LED itself runs very cool (<60C) because it has huge heatsink. So touching middle of the LED (where yellow zone is) it's hot! But sides (white plastic and bolts around the LED) are just warm. 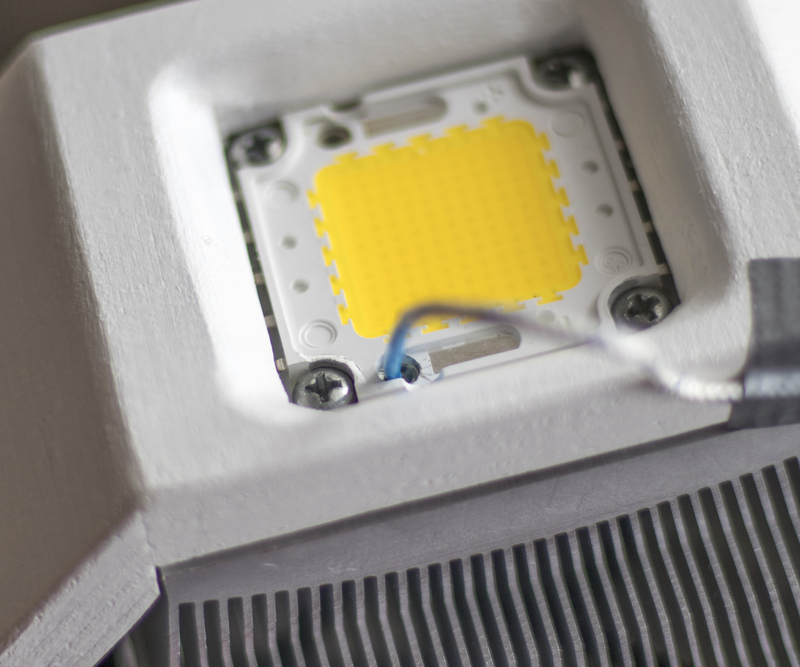 Even some 100W+ LEDs (like Cree CXA3070) comes with a plastic holder, because LED runs cool on a proper heatsink. I hope I explained well enough. Look great. I think the 100W capable heatsink is waaay overkill--the LED itself is rated for 100W, and to get 100W of heat it'd have to be running at 0% efficiency and full power. You could probably get away with a much smaller heatsink, though it certainly looks cool this way. That is the wrong type of step down module, LED,s MUST have a CURRENT limiting power supply, that one is voltage limiting only. Yes it will work for a while but if you drive the led near its rated wattage it wont last long. Look for a cc cv (constant current constant voltage) buck or boost regulator, they will have 2 adjustment pots on them. Maybe you meant step-up boost converter / booster? I updated instructable and explained why I used booster without CC adjustment. And you are right you should always use CV CC booster/buck converters for these LEDs. Not sure what you are asking, different terminologies are floating around regarding dc-dc converters. Traditionally, if you are reducing voltage its "Buck" if raising v its "Boost"
I think this would be a good universal low power converter. Using a Buck converter with about 1-2 volts higher than output should be the most efficient. This seller has many types to study. the step down module is used for the fan. the step-up or booster as he calls it is used to convert the 19V to 31V required to power the LED module. constant current in a boost converter ONLY applies if the output is ALWAYS set to be higher than the input, and the load cannot drag the output down lower than the input. Thanks for the tip. You may want to reply to the instructable itself, and post your comment as a "tip." You can do it and take credit for it.........if you want. I started a 100W flashlight but havn't finished it, been on the back burner a while.